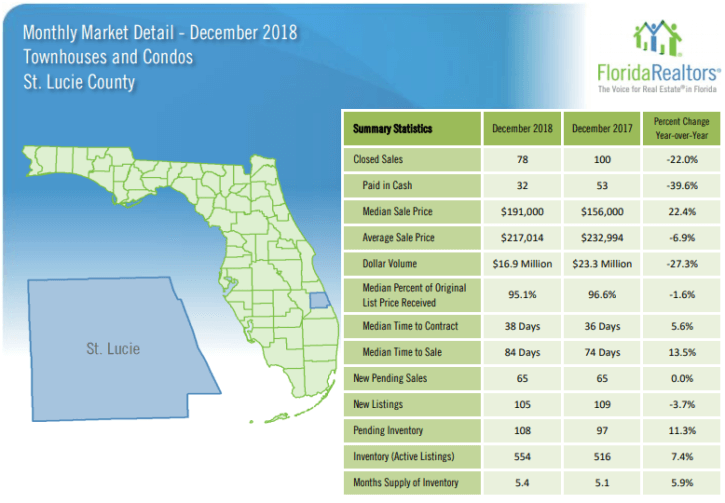 The St Lucie County Townhouses and Condos December 2018 Market Report had weaker activity when compared to last year but remains an active market. Closed sales were down by 22.0% from last year (was down by 11.2% in November) while new pending sales were unchanged for December (were up by 1.1% in November). Prices were mixed for the month. The median price increased by 22.4% from last year (was down by 10.3% in November) while the average sales price decreased by 6.9% (was down by 7.7% in November). The inventory of available townhouses and condos increased by 7 units from last month to 554 units, which is 7.4% greater than December 2017. The current inventory is 5.4 months, which is 5.9% greater than the 5.1 months of inventory last year. The St Lucie County townhouses and condos market continues to be a seller’s market though it appears to be drifting towards a balanced market. Typically a 6 to 7-month inventory is considered a balanced market showing no advantage to either buyers or sellers.